In what is becoming more and more a common tool in the war between the Xbox 360 and the PS3, EA and Sony have signed an exclusivity deal for the upcoming Battlefield 3 DLC. The deal will bring all additional content to the PlayStation Network one week before it appears anywhere else. Currently, Microsoft and Activision have a similar deal in place for the Call of Duty games, which grants Xbox 360 owners a full month of taunting their PS3 and PC counterparts. It likely hasn’t caused many people to buy an Xbox or sell a PS3 just for the one month head start, but those that own both systems and are deciding which version of the game to buy have likely flocked to the system with the faster line to new content. The map packs have proven to be big business for most online games, especially Call of Duty, which has sold tens of millions of add-ons at $15 apiece. The current Call of Duty game, Black Ops, has released three competitive-based map packs and one zombies co-op map pack–the most downloadable content of any of the Call of Duty games. All have been a success, so you can expect Modern Warfare 3 to follow a similar tact. Activision has already claimed that there will be at least 20 pieces of game add-ons, but it isn’t entirely clear yet what those add-ons will be. Regardless, the add-on business isn’t going anywhere, and both EA and Sony know it. On the PlayStation Blog, DICE’s Junior Product Manager, Tommy Rydling, confirmed the agreement between Sony and EA. The first map pack–due later this year–will be titled “Back to Karkland” and feature four maps from Battlefield 2, revamped and upgraded. The map pack will appear on the PSN one week before PC or Xbox 360. Although no exact release date has been given for the expansion, this particular map pack is also available as a bonus for those that pre-order the Limited Edition version of Battlefield 3. The multiplayer beta which features one level of the Rush game mode set in Paris, is also set to begin later this month on September 29. 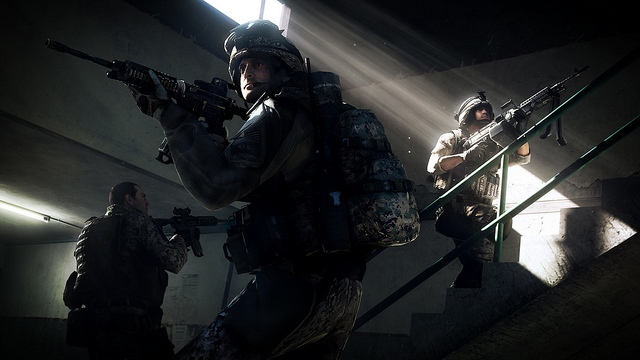 Battlefield 3 will be released for the PC, PS3 and Xbox 360 on October 25.